2014 was a pretty good year. We had our bumps and scrapes by (but what year doesn't? ), overall though, this is one for the books. Unlike most, I didn't make a resolution for 2014. I find that if I make one resolution, it quickly falls by the wayside. However, for a while I was making monthly goals and was able to stick to those (for the most part). I only did this for June, July, August and September, and then I just got too busy at work to follow through. I think if I made one goal for the month instead of multiple, I might have better luck. I'd like to make a resolution this year, but instead of one thing, I'm thinking a word of the year. I may share that with you tomorrow. I don't talk about this too much, but Dave and I have started to get back on the health wagon!! When we moved to Norfolk, we both gained a bit of weight, due to stress from jobs and the general shock of a brand new life. I am so incredibly happy to say that as of right now, Dave has lost a little over 40 pounds from his heaviest weight (sometime in winter/spring of 2012), and I have lost a little bit over 15 pounds. His weight loss has been dramatic this year, while mine has been more gradual, but in 2015 we both have some major health and fitness goals ahead of us. I brought this little space on the internet back to life! What started as a page called "Lavender's Blue" on April 8, 2011 ended when I started to take longer and longer breaks from blogging, and eventually a year long hiatus. I continued to read blogs (many of whom are my friends right now!) but I was a bit of a lurker. Last April, around LB's blogiversary I got the itch to bring this space back to life. I knew I would need a complete re-branding if I was going to stick with it. I am so happy to say that I have written more (and better quality) posts since April than I have in the entire time this space was named Lavender's Blue. This space and the blogging community has been an incredible outlet and support for me in some difficult times. I can't wait to see what 2015 brings for Always, Al. I'm never sure if relationships count as accomplishments, but I feel like I am growing stronger relationships in my life all the time. I struggle with this, because I am an introvert who has to put on her work face often, but this year I have found (and strengthened some already existing), very genuine relationships. 2015 is proving to be the year of marriages! Not for us, as we are getting married in 2016, but I seriously have 4 friends that are engaged!! It is a crazy time, but one filled with love!! This girl isn't planning on babies in the near future, but I can't wait to be an auntie to my friends kids, so that I can hold and squeeze and love them, and then give them back!! On the note of weddings... in 2015 we are going to be planning ours! Right now everything is extremely bare bones, so I can't wait to delve into the details. I have been dreaming of this day with Dave since I was 16 (!! ), and I can't wait to create the most fun, love filled, day with our families. I'm excited to get organized. I just purchased a Whitney English Day Designer, and I feel like my life is changed. In 2014 I just used a $10 planner from Target, and though that was okay, I definitely needed something for a daily view. When I started testing out the free printable pages, I knew I had to have this. I am ready to start 2015 on an organized note! I'm excited to continue our goals from last year, while creating some new goals for this year. Like I mentioned, we both have some goals with fitness, I have some goals for this space, and a couple others. But that doesn't mean that I want to let my accomplishments (and the smaller goals that went with them) fall by the wayside. I want to continue on a forward path. I am so ready for 2015. Are you? What have you accomplished this year? What are you excited for? You accomplished a lot this year! So glad you started blogging again and that we're getting to know one another better. Happy New Year! It is apparently the time for weddings, we went to 6 in 2014. Congratulations on the health progress, can't wait to see how much more progress you make in 2015. Thanks for linking up! 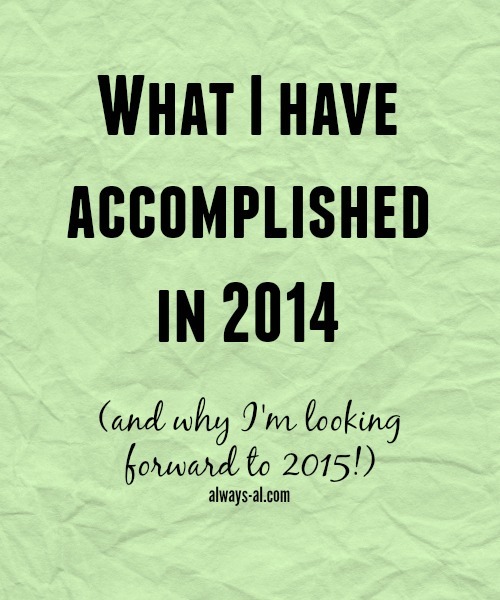 Great job on all your accomplishments in 2014! I'm setting goals for being healthier in 2015 too. Have fun planning your wedding! What a great year you have had in 2014 and looks like 2015 is getting off to great start! Thanks Christina! That is so sweet of you to say! Expanding my social circle has not been the easiest thing for me to do (I am definitely an introvert! ), but it is so worth it. Especially in the blog world, there are so many kind, supportive people that I never would have met if I didn't branch out of my comfort zone. Thanks for hosting the link up! It really got me thinking! It was a great year! It really helps to put it all down in writing to see where you began. Sometimes I forget all the things that were included in this year! Thank you! That is so sweet of you to say! It definitely helps to put it all down on paper. I didn't think much of this year until I wrote it out, and then I felt much better about it.